Collegiate baseball player who always has had a passion for fitness and competition. Personal trainer for about 4 years until Crossfit turned my life upside down. Performed my first WOD about 3 years ago and witnessed the challenge I have been looking for. Strong passion for helping and motivating others to reach their fitness goals. 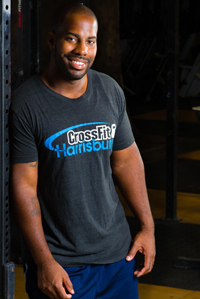 Grateful to be a part of the Crossfit community and even more grateful to coach athletes at Crossfit Harrisburg..... DO WORK!!! !